Bestselling author Rick R. Reed returns with a new novel that takes us back in time to 1991, at the height of the AIDS epidemic, and this talented scribe has crafted another tale that is practically impossible to put down. Caregiver is the story of Dan and Mark, a young couple with problems mostly brought about by Mark’s cocaine addiction. They’ve recently relocated to Florida from Chicago, in an attempt to distance Mark from the temptations brought about by being too close to his drug buddies. The issues Mark faces while trying to maintain his sobriety are only one in a myriad of difficulties that the couple grapples with while Dan looks for a job and the pair try to adjust to the change in dynamics of their lives. In his spare time, Dan finds a new calling by volunteering as a “buddy” to AIDS patients at a local clinic. Adam is the young man to whom he’s assigned and while struggling with his own problems at home Dan becomes attached to Adam, although in only a platonic sense. Dan also meets Adam’s partner, Sullivan, who is not altogether comfortable with the appearance of Dan into his life but Adam’s dependence on his new “buddy” is such that Sullivan doesn’t interfere. As Mark inevitably falls off the wagon and resumes his cocaine habit, Dan is left to deal not only with the feelings of betrayal and fear that he thought he’d left behind in Chicago, but also with Adam’s seemingly self destructive behavior and a growing attraction to the aloof Sullivan that cannot be denied. 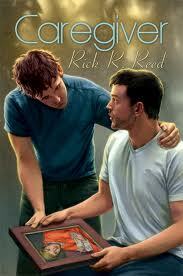 Rick R. Reed is a man who has proven his talent in more than one genre of literature. With Caregiver he shares his adeptness at involving his readers with characters in trouble as well as bringing in the human touch that sets his work apart from his peers. This is a book which will resonate with anyone who lived through the AIDS epidemic of the late eighties and early nineties, as everyone was touched in some way by the horrors of that era, but it is the eternal tenacity of the human spirit that Reed imparts in such a meaningful way with Caregiver.